Windows 7 has seriously toned down the User Account Control (UAC) — the annoying security feature in Vista that perpetually popped up asking whether you’re sure you want to do something. You can now customize the UAC’s warning level to match your comfort level, from paranoid to relaxed. Remember: By lowering the warning level of the UAC, you’re leaving your PC more vulnerable to the dark forces of computing. If you find yourself grinding your teeth more than working, Administrator account holders can adjust Windows’s paranoia level or even turn it off. Click the Start button, choose Control Panel, and click System and Security. The Control Panel lets you tweak how Windows runs on your PC. In the Action Center section, click Change User Account Control Settings. A scroll bar appears on the screen, set three-quarters of the way up to Default. To relax User Account Control, slide the scroll bar down; to increase its strictness, slide it up. Always Notify Me When: You’ll have a very secure PC but a lot of false alarms. 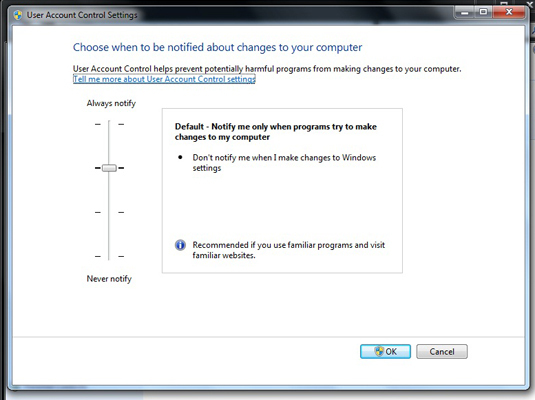 Notify Me Only When Programs Try to Make Changes to My Computer (Do Not Dim My Desktop): Less secure, this setting warns you only when a program tries to make changes. *Never Notify Me When: The least secure, this setting stops warning you when you or programs make changes. You must restart your PC before it takes effect. Choose the setting that makes you the most comfortable. Click OK after choosing your comfort level. If you change your mind, turn the Permissions screens back on by following these steps, making sure to return to the Default setting in Step 3. Windows 7’s permission screens are called User Account Control or User Account Protection, depending on the person you’re asking.